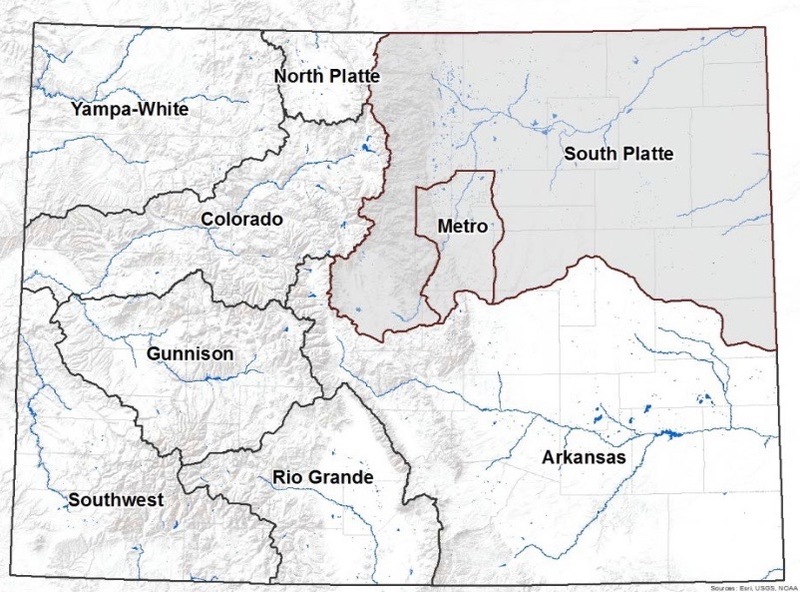 A map putting the South Platte River basin into context, from the South Platte Basin Roundtable's basin implementation plan. LONGMONT — The members of the South Platte basin roundtable gave a hearty round of applause recently to the idea of studying the feasibility of a new dam on the lower South Platte River. The applause was given to state Rep. J. Paul Brown after he described a bill he has introduced in the legislature to spend $250,000 on a study to find out how much water has flowed down the South Platte River and into Nebraska over the last 20 years in excess of the amount required by the river compact. “In 2015, more than two million acre feet of water that were delivered to Nebraska by the South Platte River could have been stored and used in Colorado,” Brown’s bill, HB 16-1256, states. Brown is a Republican and represents House District 59, which includes Archuleta, Gunnison, Hinsdale, La Plata, Ouray and San Juan counties. His proposed study would include a list of locations of possible dam sites along the mainstem and tributaries of the South Platte between Greeley and Julesburg, which is near the Nebraska border. For each location, the study would describe the amount of water that could be stored there, an estimated cost of a reservoir on the site, and cost-benefit analysis of each potential project. The Colorado Water Conservation board would be charged with developing the study, along with the state engineer’s office. 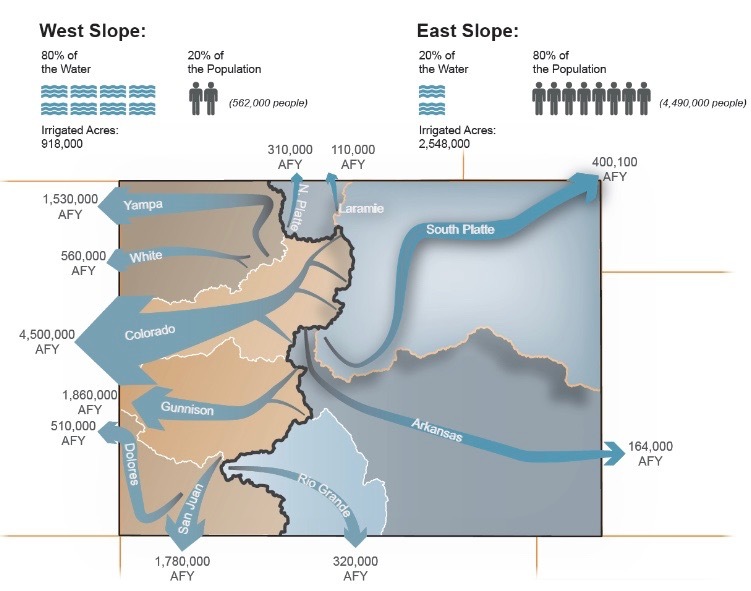 A graphic showing how water use in Colorado differs on either side of the Continental Divide. Brown’s bill cites the numerous benefits that could come from a big dam on the South Platte, including helping to meet the state’s projected gap between water supply and demand, reducing the practice of “buy and dry,” and allowing for more groundwater pumping. “It would take pressure off of the Western Slope water,” Brown told the roundtable, though he also conceded there is doubt about that on the Western Slope. The study is to be completed by Nov. 30, 2016, and a summary is to be submitted to the legislature. The money for the study is to come from the severance tax funds received by the CWCB. Those funds are now expected to drop significantly this year due to a slump in the state’s oil and gas industry. Brown responded that South Platte roundtable members could talk to local elected officials and ask them to support his bill. Rep. Bob Rankin, a Republican who represents House District 57, which includes Garfield County, is a co-sponsor of the bill. Brown filed a similar bill last year that died in the appropriations committee. It called for $150,000 from the general fund for a study of potential dams at the Narrows Project near Fort Morgan or the Tamarack Ranch State Wildlife area. It also originally called for a $790,000 study on the feasibility of a pipeline to bring water to Colorado from the Missouri River basin. Whether Brown’s latest bill receives the support it needs remains to be seen. James Eklund, director of the CWCB, is not in favor. One, the request for $250,000 to pay for the study has come in after the completion of CWCB’s process to select projects for its annual “projects bill” in the legislature. And two, Eklund said a dam on the mainstem of the lower South Platte is not a viable option given the parameters of the environmental management programs set up by the U.S. Fish and Wildlife Service for the lower South Platte River in Nebraska. Editor’s note: Aspen Journalism and the Aspen Daily News are collaborating on coverage of statewide water issues in Colorado. The Daily News published this story on Thursday, Feb. 18, 2016.